Every so often I like to add new routines to my life, or styles to my look, so that I move with the times and retain a youthful outlook, rather than hold rigidly onto everything I always thought was true. Of course I don’t want to be younger as I am happy with my age. There is a fine balance between acting too young and acting too old though. I am trying not to get too fixed in my ways and thoughts as I age. No-one wants hardening of the opinions! A key to remaining youthful is to be flexible with one’s opinions and open to change. I often come across something to this effect when I’m reading an article on an actress/model/celebrity/famous person of a certain age. Trying something different with your clothing like rolling up jeans. Two small folds makes a world of difference to your look and the style is everywhere at the moment. They have to be straight-ish jeans, you can’t roll boot-cut or flared jeans. Keep them quite long, you don’t want them to mid-calf, more like on the ankle. My usual thoughts on nail colour are bright or dark on toes, and pale pink or nothing on hands. Wearing a bright colour on short nails is nice for a special occasion. It feels young and fashiony. Trying something different with makeup. Going from emphasis on the eye and glossy neutral lips to a very lightly made-up eye, groomed brows and brighter lips. Changing my food routine after reading something inspiring. I add things in like avocado with my lunch or reinstate having lemon juice in water first thing. At the risk of sounding like a Joan Collins groupie (I mentioned her in yesterday’s post too), I read that she owes her wonderful complexion to avocados as she eats one every day. So I do too now. 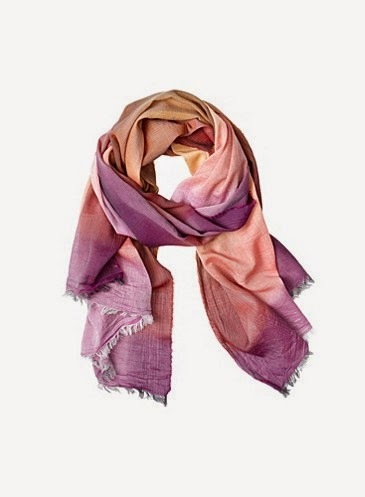 Wearing different scarves – rather than heavy silky squares or pashminas, I’ve been wearing fine cotton weaves/chiffon in prints or plain colours with short fringing. The image above is not one of mine but reminiscent of the style. They just feel more current. See what music is popular and have a listen on YouTube to see if you like it enough to purchase. Check out book lists like the New York Times bestsellers and choose something different to read. Go out to see a movie rather than watch a dvd at home. Every time I do this I think to myself how much fun it is to go out to a movie and then another six months goes by before I do it again. I’m sure it must be about time for another outing. And finally, don’t think or talk of myself as old. It doesn’t matter what age you are, you will always be older than some (and younger than others). I don’t want to be one of those people who say ‘well at my age what can you expect…’ or can’t face another birthday. Um, how about celebrating the fact that we’re alive? What’s your top tip on staying buoyant, fresh and full of life? To Suzie above- I just turned 65 and something changes as you get through the 50's. Shoulds and shouldn'ts seem to fall by the wayside. They've been replaced by, "Do I like or enjoy it." It doesn't matter if something is "too old or too young." It is how you feel about it. And you can trust yourself to make the right decision; it is almost instinctive at this stage of life. What do I do to keep a youthful outlook? I continue to try new things, like guitar lessons. And Fiona, I love the expression, "hardening of the opinions." My mother, sadly, has this and it pretty much ruined her joy of life. Fiona, this is a lovely post and you're wise to live this way I think. My fave tip for staying one's best as we age is to never ever stop learning and to stay engaged (and creative) no matter what. My observation of many older people is that those who are continually learning, engaged, and passionate about something, whatever that may be, are youthful in spirit and enjoyable to be around, even if older in body. And younger people look up to them and want to be around them. I think it's that verve to continuing growing that's the key. And I think it's wise to keep one's grooming a priority too so you feel good about yourself and appear polished. Both my husband and I are very adamant about that for ourselves. I see many older people who are not. (And younger ones too though.) I like your ideas for dressing current, yet retaining one's own classic style too. I agree that there's no need to want to look younger than you are, but that it's good to look your best at your current age. Not to mention it's more fun to dress up a bit and be stylish! I think travel helps one stay young too as it's a form of learning. And even if one can't afford large trips, a night here and there away at a beautiful place, or a day driving trip on a Sunday are refreshing learning experiences. Blessings for a beautiful day in New Zealand! I really enjoy your posts and serene and studied outlook on life in our frenzied world. I agree that it's important to stay interested and excited about learning. I am happier than ever at age 57 because I am more confident in who I am and less likely to worry about what others think. I also think it's very important not to dwell on talking about age. I had a friend who, when she was 47 and I was 42, was constantly talking about how old she was etc etc and after a while I started to think of her as way older than me. I learned something from that! Just wanted to let you know that I recently found your blog and am enjoying all your posts. To add to all the other lovely comments, I would say that I try to think of myself now as the younger version of the older me. No matter how old I sometimes feel, I will one day (hopefully) be older. So I try to see myself now from that older perspective. As another commenter said, then the "shoulds" and "shouldn'ts" give way to questions of genuine meaning.